By Dawn's Early Light: Germany's Angela Merkel the Next Bismarck? Germany's Angela Merkel the Next Bismarck? November 26, 2005 - Welcome Instapundit and Belmont Club readers. Make sure you click on the comments section to read some challenging ideas by Joe Katzman and M. Simon of Winds of Change along with UK's Peter Gentle of the up and coming Polish based blog Beatroot and systemic thinker Dan from tdaxp. Also see DEL post "The Belmont Club Weighs In on Merkel" as a follow up to the Belmont Club piece (above). Otto von Bismarck was the brilliant leader of Germany (1862-1890), responsible for unifying the country, building an empire and securing peace in Europe through a complex system of alliances that his successors could not maintain. "His most significant policy objective was that of securing German unification; he took advantage of skillful diplomacy and a series of wars to achieve this goal... 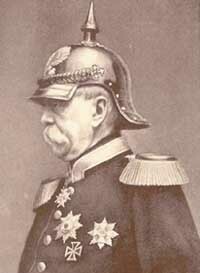 In foreign affairs, opposed to his previous "Blood and Iron" policies before the unification, Bismarck pursued the goal of uniting Germany under Prussia's leadership, and as 'honest broker' securing the German Empire's position by maintaining peace in Europe with a complicated system of alliances." Bismarck built a strong German military, sought to not compete with the British with its colonies or navy, contain the French by securing alliances with Austria, Italy and at times Russia. He was the leading statesman of Europe, being responsible for such treaties as the "Three Emperors' League" (Germany, Austria-Hungary, Russia), "Triple Alliance" (Germany, Austria-Hungary, Italy), "Reinsurance Treaty" (Germany, Russia). What Bismarck created in Europe with him at the helm provided great stability for Europe (though not necessarily needed economic reform), but was too complicated a system for leaders of less than his caliber to grow, let alone maintain. The result of the failure of European leaders to continue the balance of power in Europe led directly to the First World War [DEL strongly recommends Pulitzer Prize winning, Barbara W. Tuchman's Guns of August as an exceptional novel on WWI, Dr. Henry Kissinger's Diplomacy and noted Military Historian John Keegan's The First World War] and changed civilization forever. The balance of power in Europe changed radically after the collapse of the Soviet Union. Germany became focused on integrating its two separate countries. The United Kingdom continued its Atlantic focus while slowly moving towards European integration. This left France coyly attempting to leverage German strength yoked to Franco-diplomacy, thereby creating a new center in Europe. Once Gerhard Schroeder defeated Helmut Kohl for leadership of the German state and her diplomacy, his goals where short term in nature. Attempting to secure his position in power domestically appeared often his only long-term goal. Chancellor Schroeder tacked every which way the wind blew to gain domestic support, including anti-American positions, such as colluding with the French to thwart US efforts in Iraq. He succeeded in damaging the US-German relationship and threw his efforts behind Franco-Russian diplomatic enterprises, even creating a "special relationship" with Vladimir Putin, to the rightful frustration of Poland. While UK Prime Minister Tony Blair was often described as America's "Poodle" in the British media, Chancellor Schroeder proved himself far better as Chirac's "Poodle". German foreign policy was marked by stagnation in the past decade without pushing forward major economic reforms other than European Union integration (with an anti-American bent) that moved along until the French "Non" vote and betrayal of the German position over the EU Constitution [See DEL posts "Why France's Self-Destruction Matters" and "France and the EU Constitution"]. Germany's economy, much like France's, was marked by chronic high unemployment and a growing welfare system, and was unable to support a future Germany that was robust in world affairs. German Chancellor Angela Merkel's Brilliant Diplomacy - Another Bismarck? Gerhard Schroeder's domestic failures could no longer be masked by his short-term anti-American political maneuvers. Ms. Angela Merkel, an East German woman, in a close election beat out Mr. Schroeder narrowly [See DEL's June 9, 2005 post "A Name to Watch in Germany" for more background on Ms. Merkel]. Because of the concessions a grand coalition required to form a new German government with Ms. Merkel as its Chancellor, the European press was writing off any potential change she could make on German foreign policy, especially as Schroeder's party retained the Foreign Ministry position. "Mrs Merkel spoke of 'close and friendly' relations with France but signaled that the relationship would no longer be exclusive or specially privileged." "Mrs Merkel deftly called on Mr Chirac to join her new Germany as a partner in a new European project - liberal economic reform. Without it, she said, Europe's social model would be lost forever. She listed the areas needing action - freeing up Europe's markets for services to boost growth; business deregulation; and getting Europe fit for global competition with Asia. But in each of these areas, France has dragged its feet, preferring protectionist solutions to the perceived hardships of allowing more open competition." Ms. Merkel is taking the reigns of EU diplomacy from a wounded Chirac by moving towards the center of EU politics as an "honest broker". Visiting NATO headquarters in Brussels was a strong indicator of Ms. Merkel's desire to strengthen ties with America and reaffirm the Atlantic Alliance as the primary guarantor of Europe. This was deft, because it didn't require a meeting with an American counterpart. As a woman who grew up in communist East Germany, she has a clearer understanding than her predecessor of the value of not playing politics with your country's long-term national security interests. "Unlike European countries like France, Merkel is not critical of the rebate and stresses that it is just one issue which needs to be looked at in order to clinch a budget deal. 'We need to address the concerns of everybody, net contributors and net beneficiaries. It doesn't just hinge on one issue,' she said." Ms. Merkel, like Otto von Bismarck almost 150 years before, has positioned herself (all the while in a weak government) as the center of gravity for any reform and progress in Europe. She has distanced herself from the non-democratic Russians, usurped the stumbling French, and opened the door to the outsider British while affirming America's role in European security. And all this with one tour. Does Ms. Merkel have the savvy and intelligence to pull it all together and reassert Germany's predominant role in Europe in the tradition of Bismarck? Time will tell, but Ms. Merkel seems off to a great start. Prepare for the to-and-fro of mixed signals from Germany. Merkel may have positioned herself - but the enduring question is whether she can position her government. The jury is still completely out on that, and I myself am not an optimist. At least she's setting out a choice, and her reluctance to be France's poodle will help diminish France's influence - but don;t expect a real move of any kind until the German electorate actually makes up its mind. Her idea of how to fix the German economy is to raise taxes. I think she is a couple of clues short on economics. Maybe the above comments are right. Merkel is not in the same position as a US politician like Bush. She does not have the power. She must also try and lead a 'grand coalition', made up of christian democrats and social democrats. So, basically, there will be no change in Germany. From a Polish perspective, Merkel is a disaster. Her party has made noises about wanting to take back, or receive compensation, for parts of Poland that Germany lost just after WWII. And though the German economy is a sleeping giant at the moment, when you go there you get the impression of a fantastic country. Every public service works. The streets are clean. Poeple are educated and warm. The same is true in France. As a Brit, sadly, I cannot say the same for the UK! While I am generally pro-Polish, a country that forbids Germans to own land hardly is in a position to say "get over history"! Ah Americans desperate for a an European kiss, every Euro premier that want to mend gets a pass... Ok joking. No Merkel while better or less worst than Shroeder doesnt have power to cut the fat in German and make them look for futur. Every great political leader that changed a country had a vision from Reagan to Thatcher to Gorbatchev(albeit Gobby had fuzzy one) just to talk about recent ones. Now what is the vision of Mrs. Merkel? So is Merkel going to go after the Catholic Church like Bismarck too? i think you forget something, she has got the ablsolute majority in the bundestag and her calition partner together with her party stand, at least until today, behind her. So it will be much easier for her to make big changes, then for a government with a smaller majority. and, i live in germany and i haven´t heard anything about thoughts of getting polish land back, because we don´t want it, it´s hard enough to rebuilt eastern germany!!! It is a good posting. I like it. It's pretty much impressive. The Sleeping Giant was voted number one for a list of Seven Wonders of Canada, with a total of 177,305 votes, beating the Bay of Fundy, and Niagara Falls by almost 90 000 votes.